I'm a relative newcomer to the world of Minecraft. My sons have played it for years now, but I really just started getting into it myself this last summer. My younger son put me through a kind of boot camp where I had to put in sixty hours of Minecraft in about ten days...and by the end of that, I loved it. I'm not a pro, in fact I'm still a "noob" according to the kids. But I dig it. (get it?!) 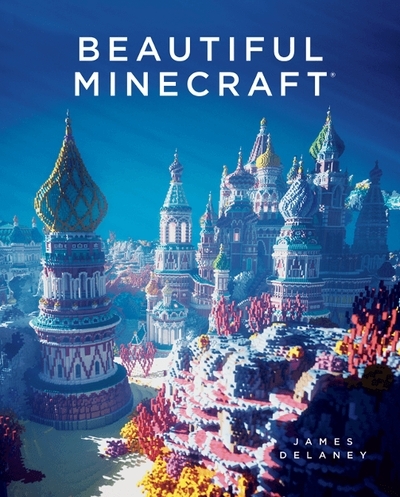 Sometimes it takes a greater vision to see the real potential of a building tool, and that's what you get in No Starch Press's new book, Beautiful Minecraft. Each has favorite builds for me; Mats Heiberg's "Babel" is a particular favorite. The gothic-inspired ornate island palace/cathedral/magical realm is beautiful in scope and detail. We don't get much information about the builds -- evidently "Babel" was all Heiberg working alone, and comprises 8 million blocks and took 31 days to build. Which is insane. But the results speak for themselves. Something it's difficult to get a sense of with the builds is the scale of them -- most of these aren't built on a conventional Minecraft scale (scaled to the size of Steve and the Creepers), but they use the blocks as smaller pieces to build structures of greater scope. The spaceships and stations are another favorite section in the book -- seeing how visions of the future could be interpreted in Minecraft is something that I hadn't even considered while building my own little worlds. Again, the scale of these is difficult to comprehend, but they're stunning in the complexity of their design. I'm not sure what I was expecting with Beautiful Minecraft -- it makes a good companion piece to some of No Starch's other books in a Beautiful LEGO series. They both bring attention to the use of these children's games and toys as a legitimate art form. Just as Nathan Sawaya's LEGO sculptures have made people see the potential in plastic bricks, the artists (and they are artists) in Beautiful Minecraft make an argument for how this highly pixelated game can be used as a medium. My one issue with the book is that there isn't enough text from the builders. There are a few short pages explaining some of the process, but not much about the inspiration behind the projects. There aren't "artist statements" that I feel would be illuminating, especially to some of the more abstract pieces. The bits we do get are so interesting -- the difference between creating a sculpture in Minecraft (above) and sculpting in stone, for example. I would like to see more of that. In my own book Play Like a Pirate: Engage Students with Toys, Games, and Comics I have a section on Minecraft with a lot of ideas for how to use it in the classroom. I never considered how it could be used as a medium for "digital sculpting." But looking at these examples, there's a lot of potential there. Even to use as a 3D render before moving on to create the sculpture in other media, but using a platform that kids are already very familiar with. Because when it comes down to it, they are. The kids in your classroom know Minecraft. If they don't, their best friend or sibling or parent does. With support from books like Beautiful Minecraft, with Minecraft EDU becoming more robust with each update, this is a tool you're going to want to learn about. This book can be a good place to start.